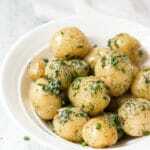 Baby garlic potatoes boiled until tender, drizzled in melted butter and tossed with dill and minced garlic. A show stopper side that's quick, easy and freeking delicious! Wash your potatoes and throw them in a big pot. Cover with water and place over high heat on the stove. Bring to a boil and turn the heat down to medium. Boil until your fork goes through a potato really easily. While the potatoes are boiling, mince your garlic, chop your dill and melt your butter. Drain the water from the potatoes an pour the potatoes back into the pot. Sprinkle with salt and pepper, pour the butter over, throw in the garlic, dill, and chives and toss the potatoes until they are all covered. Pour into a serving dish and serve!